Traffic conditions, the terrain, wind, idling at traffic lights, gasoline thieves, leaking fuel tanks and many other factors influence fuel economy. While many of these conditions cannot be changed, most drivers acquire driving habits which have a tendency to waste fuel. The following suggestions may aid in securing greater fuel economy. In cold weather, economical starting of the engine is obtained by “pumping” the accelerator pedal once or twice before starting. Push down the clutch pedal and start the engine using the choke sparingly. Do not use the choke when starting a warm engine. Do not use the choke excessively while the engine is warming up and never leave it out longer than absolutely necessary. Accelerate gently, stomping on the accelerator forces more fuel into the cylinders than can be economically used. Holding the vehicle in second gear until you get up to high speeds may easily double the fuel you should use in getting under way. Shift into high at about 20 to 25 miles per hour. Fast driving requires more fuel. At 60 miles per hour your engine uses twice as much fuel as it does at 20 miles per hour. Travel at moderate speeds if you wish for fuel economy. Decelerate to a gradual stop. Sudden stops like sudden starts waste fuel. Park your vehicle in the shade if possible. The hot sun evaporates gasoline. As the fuel in the tank heats up it expands, therefore forcing fuel vapors out of the tank. As the fuel in the tank cools off it contracts, drawing air and water vapor into the tank. Keep your fuel tank full to prevent this. Don’t drive with less than the proper air pressure in your tires. Under-inflated tires mean more road friction, more work for the engine to do and therefore more fuel consumed. Keep the battery charged up in good condition. A fully charged battery means quick starting and provides good ignition, reducing loss of fuel. Be sure that the carburetor is in proper condition for maximum mileage and power. One faulty or dirty spark plug may waste as much as ten per cent of your fuel. Have the spark plugs checked occasionally. Keep your vehicle well lubricated at all times. 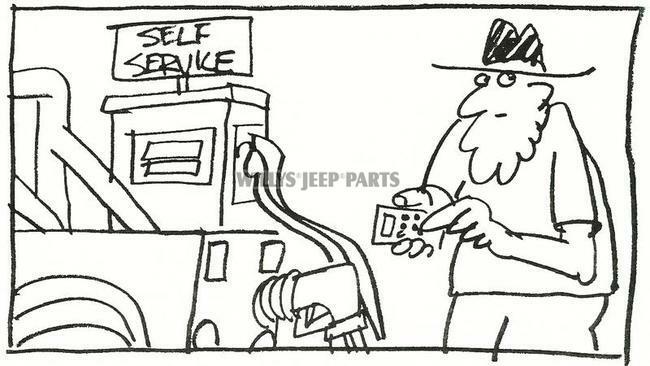 Be careful to follow the lubrication instructions and intervals as shown in your Owner’s Manual or Service Manual. Keep the radiator filled to the correct level to provide a more constant engine temperature. An overheated engine uses more fuel. Check the operation of the automatic heat control on the exhaust manifold. The purpose of this device is to warm the mixture of air and fuel, as it leaves the carburetor, to provide better vaporization. It will save fuel to have a complete engine tune-up every 5000 miles, or at least twice a year. To secure best performance and dependability, the engine should have a periodic tune-up each 5000 miles or at the end of each 500 hours of off-the-road use. To secure the best results, it is recommended that a definite regular procedure be followed as outlined below. It is essential that the carburetor receive attention at the last of this sequence as it is impossible to satisfactorily adjust the carburetor until other units are correctly adjusted. 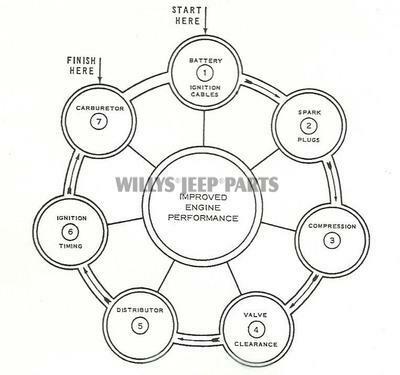 Every four-wheel drive Willys Jeep vehicle was outfitted at the factory with standard military type tires mounted on narrow 4 ½ inch to 5 ½ inch wide 15 inch or 16 inch steel wheels. The performance ability of these tires and wheels has been proven with military use unchanged through three wars. 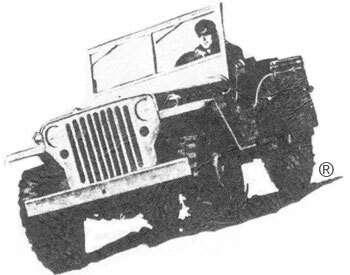 The Willys MB, Ford GPW and Willys CJ-2A will go just about anywhere with 6:00 x 16” non-directional tires properly inflated for the expected use whether it be sand, snow, rocks, mud or the paved highway. It doesn’t take a genius to figure out that a set of four 35 inch tall gumbo’s mounted on 10 inch wide wheels that weigh in at upwards of 100 lbs each rolling down the road just might blow your fuel economy through the roof! Take some time and look through some of the original Willys publications. You might take note that not a single vehicle was ever equipped with a 250 pound roll-over bar, a 200 pound chunk of 5” wide steel channel with a 100 pound tow bar hanging from the front bumper brackets or a 150 pound 5” wide steel channel welded to the rear cross member. It takes a lot of gasoline to haul all of that useless junk around day after day. And don’t forget that 100 pound oversized spare wheel and tire to match the four others that your little four-banger has to push down the road or trail. In other words "LIGHTEN YOUR LOAD". Obviously you’re going to have to jack-up your body and chassis up over the axles in order to make those gnarly-assed 35 inch tall tire and wheel combos fit. Oh oh sounds like more non-functional useless heavy ornamentation to include longer heavy leaf springs, crazy looking extended spring hangers and shackles, big fat long shocks, longer heavy duty drive shafts, a longer heavy duty steering arm, etc, etc. Watch out going around a corner and may god help you driving on a slope! Oh, I almost forgot, that’s why you needed that 250 pound roll bar. But then you just have to get a pair of those sporty off-road racing seats with the four or five safety belts to keep you in the vehicle when it does roll over. After all is said and done you just can’t explain why your Jeep rides like an un-sprung covered wagon, but I’ll bet you chiropractor is a happy camper. One of the most economical and simplest ways to save gas and relieve the workload on your little four-banger or any other engine for that matter is to install a set of selective drive hubs on the front axle hubs. The installation can usually be accomplished in an hour or so and no special tools are required. So, what can you expect that might affect your fuel economy from this? Well here is the plain scoop. When you place the selective drive hubs in the “FREE” mode you have just disconnected the front wheels and hubs from the drive train. The front axle shafts no longer turn, the front axle gears no longer turn, the front drive shaft no longer turns and most of the transfer case is no longer turning. You have essentially temporarily converted your Jeep into a two wheel drive vehicle with the front wheels turning and steering but a hundred plus pounds of not needed steel waiting quietly for the next off-road adventure with the simple flip into the “ENGAGED” mode. Click here: 35-10 SELECTIVE DRIVE HUBS to learn more about and purchase Warn Selective Drive Hubs. Do you want to really save gasoline? The installation of an all-range overdrive is the only way to go. Screaming engines and whining gears may sound great for awhile but excessive RPM’s can mean death to your engine and any drive train component. The installation of a gear splitter overdrive unit will give your Jeep an immediate 25% reduction in engine RPM’s in all gears. Click here: 35-08 OVERDRIVES to learn more about and purchase the Saturn All-Range Overdrive. If you have ever had to deal with a six-volt automotive storage battery you certainly know it belongs in the county dump. Slow, gutless and no endurance is a description that always comes to my mind. Ever wonder why those MB’s, GPW’s and CJ-2A’s came factory equipped with an engine hand crank? That was because they were outfitted with six-volt batteries. Talk about wasting fuel! It never fails that after all that cranking and cranking, pulling the choke over and over, smelling and watching gasoline dripping from the intake manifold that you now have a completely fuel flooded engine. The installation of a modern 12-volt alternator will give you and your Willys a feeling of faith and security that you could never have had with that old six-volt system. With the installation of our alternator upgrade kit you will always have a fully charged 12-volt battery. Your engine starter will turn ten times faster and your properly tuned engine will start instantly. Your headlights and tail lights will be ten times brighter than those old dim six-volt units. Click here: ALTERNATOR UPGRADE KIT to learn more about and purchase our 12-VOLT ALTERNATOR UPGRADE KIT.